Building from the last post “pancakes without a recipe” this recipe is for gluten free pancakes. 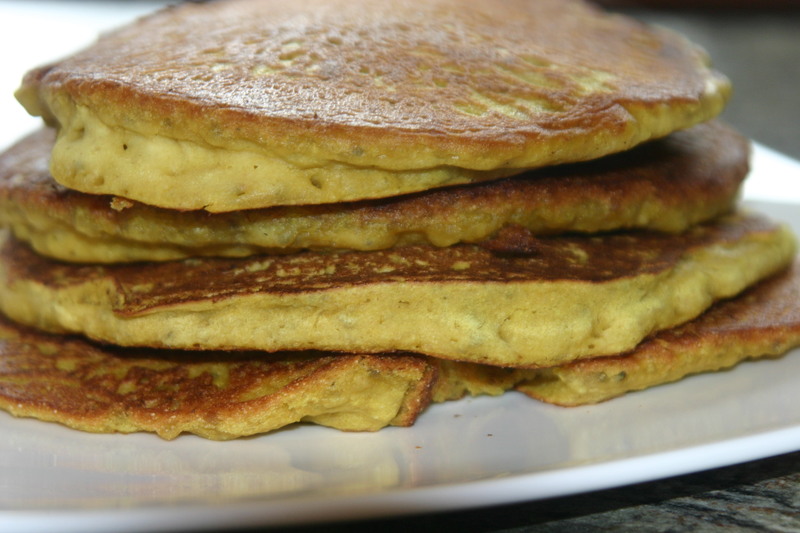 Gluten free pancakes are a bit more delicate than pancakes using wheat flour. For this gluten free recipe I used a combination of three gluten free flours to build structure. When using gluten free flours it is vital to use a combination of flour textures (buckwheat and rice) and a starch (arrowroot). The ratio here worked delightfully well, or you could use a pre-mixed gluten free baking mix. Briefly mix chia seeds and water in a mixing bowl and set aside until the chia has jelled a little, about 5 minutes. Mix the non-dairy milk and apple cider vinegar together and set aside to curdle, about 5 minutes. Once the chia seeds have started to jell, mash in the banana and stir to combine. 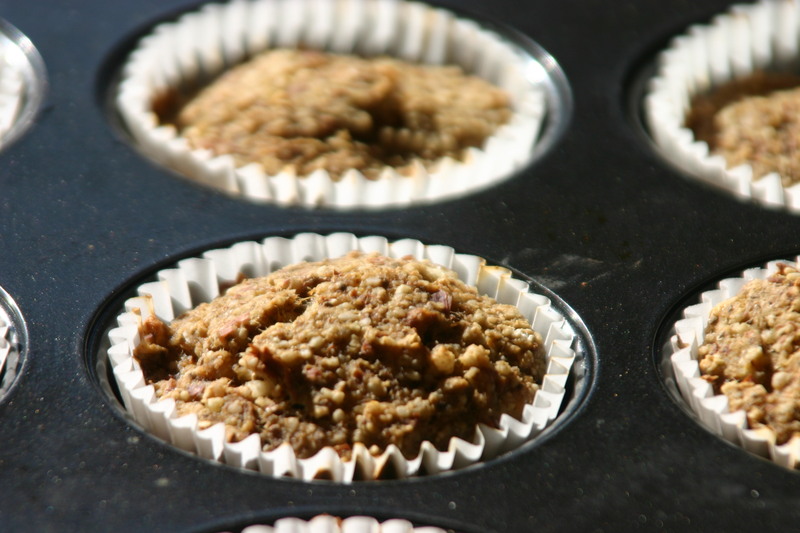 Add buckwheat flour, brown rice flour, arrowroot starch, baking soda, and salt mixing to combine dry ingredients without working to hard to mix them with the banana and chia mix at the bottom of the bowl. Add the curdled milk and vanilla whisking the ingredients until they are uniformly wet and combine. Once your desired pan is hot melt a little coconut oil in the pan, I use about a teaspoon per batch, and pour the batter into the hot pan. 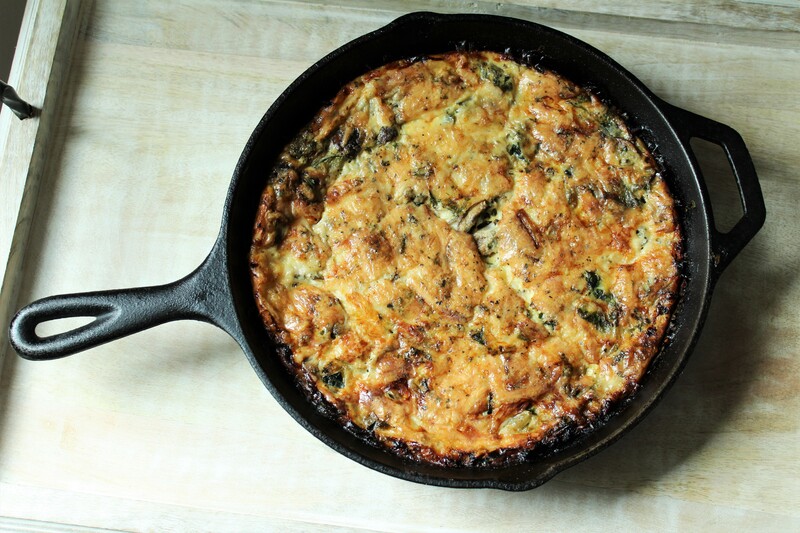 I usually make one big pancake at a time, but you can also do smaller ones and do however many fit in your pan. Cook on one side until the sides of the pancake are starting to look dry and the cooked side is turning a delightful golden brown, about 2 minutes. Serve piping hot with topping of your choice like this cinnamon roll topping. What is important for successful gluten free pancakes? I wanted gluten free pancakes as Wolfie may or may not have a sensitivity. I also wanted a yummy pancake with light texture and just enough flavor to stand up to the butter and maple syrup. Texture was the most important thing here. I used three gluten free flours for a light texture, and both banana and chia seeds for structure. As strange as this meal sounds, it is quite delicious. Wolfie is sensitive to something and I have been on a major elimination diet to try and figure it out. 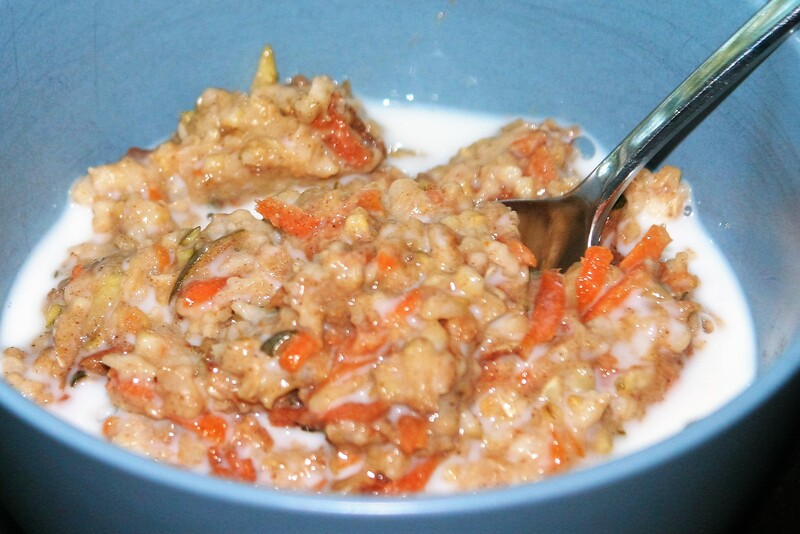 One of the things I have been eating a lot of for breakfast during this time is oatmeal. Well I’m just plain sick of sweet oatmeal and I needed something savory for breakfast. This has been my go-to breakfast for the last few weeks. It would also work for a dinner if you called it oat risotto or something fancy like that. I was hesitant to try a savory oatmeal, but I needed the salt. Ohh, do I love salt. I am now looking forward to breakfast again. 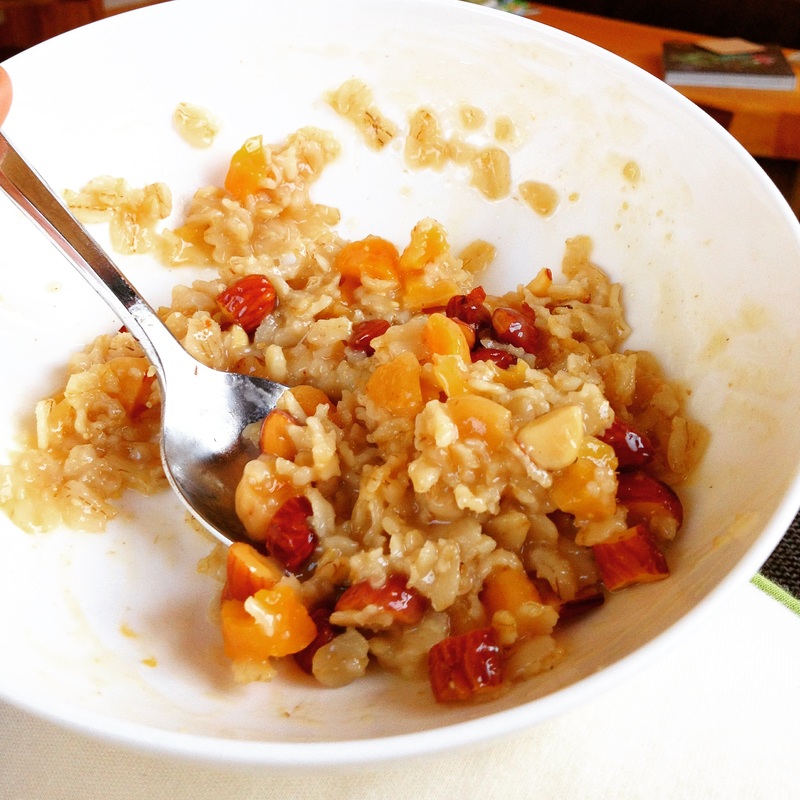 Anyway, here is a wonderful entry to the world of savory oatmeal, and one of the healthiest breakfasts you can find. This combination is one that actually keeps me full for several hours unlike most anything I eat in the morning. This is also gluten free if you make sure to use gluten free oats. I hope you enjoy it. Add oil or water and kale, sauteing until tender, 7-10 minutes. -If you cook the kale in oil it will get a bit crispy and yummy bitter like kale chips. If you want your kale more tender as if steamed use water. While kale is cooking, heat vegetable broth in a small saucepan to a boil. Once vegetable broth is boiling, add rolled oats and cook, stirring occasionally until water is absorbed, about 5 minutes. Once oatmeal is cooked remove from heat and stir in nutritional yeast. 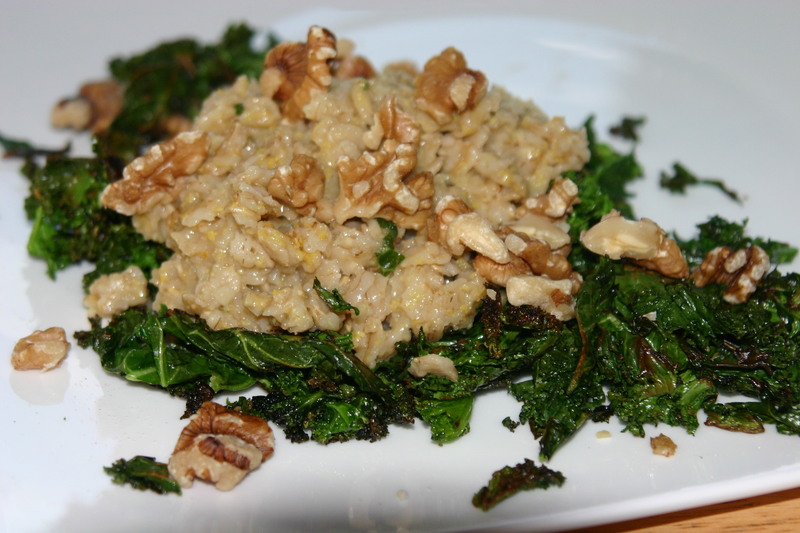 Add salt to kale to taste, then place kale on a plate, top with cooked oatmeal and nuts.